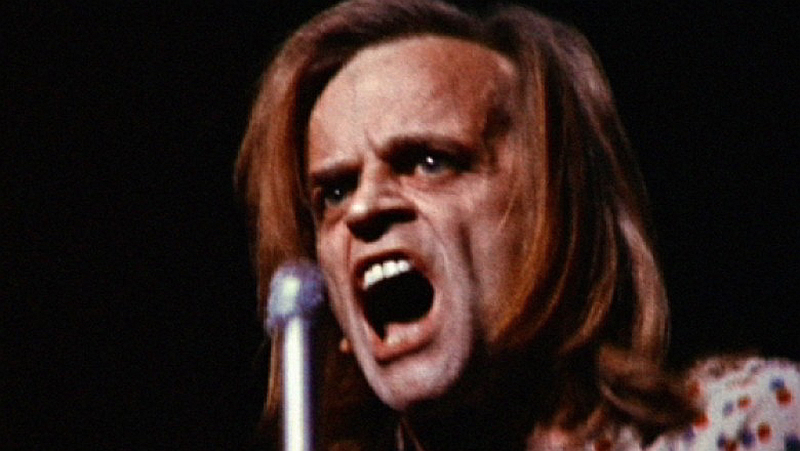 At the height of his career, Klaus Kinski was Germany’s favourite fiend. On November 20, 1971, the iconic actor took to the stage of Berlin’s Deutschlandhalle to perform a very personal reinterpretation of the New Testament, a theatrical monologue about ‘a man who would rather be massacred than continue to live and fester’. Only moments after Kinski entered the spotlight to begin his recitation hecklers in the sold-out auditorium started hurling insults, deliberately provoking Kinski into a rage until he stormed off. However, he returned to the stage time and again and eventually what was meant as the prelude to a planned world tour turned into spectacular tumult and chaos. Scenes from this evening were very briefly featured in Werner Herzog’s Kinski film My Best Fiend. But now his biographer and estate administrator Peter Geyer has made a full-length documentary out of the previously unseen 16mm footage. Jesus Christ Saviour offers a scrupulously precise reconstruction of Kinski’s legendary defiant stage performance, and the hostile audience’s reaction. Pamela Jahn talked to director Peter Geyer at the 2008 Edinburgh International Film Festival where the film had its UK premiere. Pamela Jahn: Your film documents Kinski’s attempt to engage an audience of thousands with a recitation of over 30 typewritten pages reclaiming the story of Jesus. What made Kinski do that? Peter Geyer: Back in 1961, Kinski announced in an interview in Der Spiegel (the largest German weekly magazine at that time), that he would put the New Testament on stage. Most people probably don’t know that Kinski started as an actor by doing recitations on stage in the late 1950s with verses and ballads by Villon, Rimbaud etc – So, basically, Kinski spoke himself to fame. During 1959-62 he performed and released 32 audio-books. The event was long planned, but soon after he had achieved the cover story in Der Spiegel he moved on to film where financial prospects were better. But he obviously cherished the idea. Was he to a certain degree obsessed with Jesus? I am not sure if the obsession increased with the years, but whatever he did, he was always totally passionate and fanatical about it. For example, if you watch Aguirre you get the feeling that he was exceptionally obsessed with that role, but the truth is that he actually didn’t want to shoot Aguirre in the first place. Initially, he came back to Germany to go on tour with Jesus Christ. But after what happened in Berlin, the tour got cancelled, and Kinski needed a new job. He was more obsessed with money than with anything else. Of course. Kinski sold his soul for money, which explains why his film career is so lousy. By the end of the 1960s, the Italian film industry was in deep financial crisis, and Kinski – who starred in a vast number of those low-budget Spaghetti Westerns – got in trouble because of that, too. His very clever strategy to receive incredibly high fees for only very few days of actual shooting wouldn’t work any longer. Plus, the producers had had enough of Kinski’s extravagances. Right then he got this very attractive offer from a famous German concert impresario: For the enormous fee of one million Deutschmarks, Kinski would perform in 100 venues all over the world, reciting his version of the New Testament live on stage. The initial plan was to start the tour in Germany and then take it to Europe and America. So, Berlin was meant to be only the beginning of a word tour that never happened. Kinski didn’t even get a chance to start his monologue properly, almost immediately people start interrupting him, and it seems that the audience was out for blood from the beginning… Why would they pay for someone they didn’t want to see? It’s true that the atmosphere was very tense from the beginning. Many people came to provoke Kinski, but I wouldn’t necessarily say that all of them were just thirsting for confrontation. I think it was only a small number of real hecklers, which makes it even worse, because the rest of the audience didn’t manage to kick out the few assholes and get to see the show. None of them dared raise their voice against the few Kinski opponents in the auditorium and after a while the aggressive tone took over the entire hall. Of course, Kinski misbehaved too, and so it all ended in great chaos. Didn’t he enjoy provoking people? If you look closely at his performance in the film, you see that Kinski never deliberately provoked an argument. He didn’t seek confrontation, but he also couldn’t take any form of criticism. He was too insecure for that. So in order to be able to cope with it and avoid getting hurt, he trained himself to be quick at repartee. But all the shouting and screaming on top of that just scared people, they didn’t know how to deal with him. What sort of reputation preceded Kinski in Germany at that time? It was something of an open secret that Kinski lived in luxury in his villa in Italy. He was a rich international film star. But I don’t think that his flamboyant life style or his eccentric, egomaniac persona was the problem. In many ways, Kinski often was ahead of his time, in his work but also because he was the first person who used tabloids for his own purposes. In 1971, however, he simply looked like a self-proclaimed believer, an epigone. Your film is simply a raw and meticulous reconstruction of the infamous event. Why did you decide to offer no further comments or explanation? My intention was to make his work accessible, and to be truthful about Kinski. The most interesting thing is to just see him performing life on stage, there’s no need for further explanation or attempted whitewashing. I am used to facing the aggression of Kinski fans because they hate me for clarifying lies that he made up in his book (All I Need Is Love). But it’s not my intention to turn Kinski into a super-human or create a new legend. Did you ever search for any of the people who attended that evening? No, never. Having said that, I actually never had to look for them, they came to me. I’ve met a lot of people who said that they were in the audience that night. But whenever it comes to Kinski, it seems that people’s memories become very vague. I call this the Werner Herzog syndrome, which is that, whenever it is about Kinski, you have to come up with a great story simply to make Kinski larger than life. People who say they encountered Kinksi but who were actually not really close to him, always try to turn his pretty boring private life into something bigger, more exciting. I’ve got the recorded material anyway, material that is not manipulated, so why should I ask someone else? How do you think people look at the material today? It depends on the generation. When I took over Kinski’s estate, Kinski was ‘dead’; the time for people like him is over. Today, the younger generation understands that he was actually the last non-conformist figure in the German entertainment industry. Someone who really said, ‘No – I am against your system’, but who didn’t hurt anyone. Which makes him an ideal badge to wear for people trying to be different – it’s the same with Kinski as it is with Che Guevara. Did Kinski ever think about making a film out of the footage himself? Good interview – reveals an awful lot about Kinski, his reputation and the reality of it through simply what Geyer doesn’t say. I recently watched this film – my review here http://bit.ly/bjEcgR – and would recommend it to anyone who wants to learn more about Kinski than we usually hear.